So it’s been a long time again and I apologize for that. My goal from now on is at least one post per week. For my next posts, I’ll take pictures of the projects I’m working on in my classes – Haute Couture Pattern Drafting, Fashion Illustration, and Sewing Level One. For this post though I took some pictures of my sewing studio. Sure it’s really just a room but I like to think of it as my studio, it’s got EVERYTHING I could ever need in one room. The only qualm would be a larger table for fabric cutting but the one I have in there right now is quite adequate. No more cutting on the floor! These are my two dress forms! The one on the right is Peggy Sue, my duct tape double/clone and the one on the left is unnamed at the moment but if you have a suggestion I’m open to one. I named the duct tape one Peggy Sue because I was listening to Buddy Holly one time and I just really loved how he mentions this girl named Peggy Sue in a couple of his songs. The red one is an adjustable one I got from Dressew for $125 + tax which is 50% off the original price! Whooooooooooo! It was during Dressew’s 50% off Everything in the store due it being their 50th anniversary recently. The adjustable one is great for me because I’m not very “shapely” and I actually only need to adjust the waist a little larger, the bust and hips are just fine. Peggy Sue (duct tape dummy) is problematic because she’s a whole inch or two larger everywhere due to the nature of duct taping. Also, she’s not pinnable. But I can’t seem to think of where to put her or if I should just dismantle Peggy Sue. The base is a Christmas tree stand and I used a PVC pipe from Home Depot to mount her. My sewing studio is not very big so she might have to go! The curtains I made! Wooden dowel is from Home Depot, fabric and lace from Dressew. It’s difficult to see due to my poor photography skills but that is mint fabric with white and pink lace. I love the colour combination of mint and white or cream right now…. My horde of patterns…..I also have a goal of getting through EACH one at least two or three per month after my classes for this term end. Must obtain cute clothing…. Serger! I love her so so much. I think she might need a tune-up although the other day when I was using her, she wasn’t doing so bad. AND THIS PRETTY BABY! I sold my other machine on Craigslist and actually made a little bit more money than I had originally paid for it. And then I put that money towards this sweet pea. She’s a BEAUT. The machine of my dreams, does I think 5 different buttonholes, including the highly coveted (by me) keyhole buttonhole. And my fabric and cone thread stash. I am also starting a mini spools of Gutterman thread stash. My fabric stash is actually not as large as other sewists mostly because I like to work on one project at a time and buy the fabric with a specific project in mind. 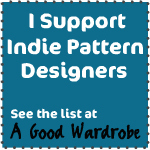 This means I don’t waste money on fabric too! But alas, I cannot control my pattern stashing. So that’s my sewing studio and I love being in it! It’s a room I’ve rented out from Brianne who lives 8 blocks away from me, it’s a nice jolly little 10 min walk from my apartment! Very convenient, it’d be more convenient if Mr Vixen and I just moved into a two bedroom but we’re kinda attached to our current apartment (despite its many downfalls) and he just doesn’t have the money to move.